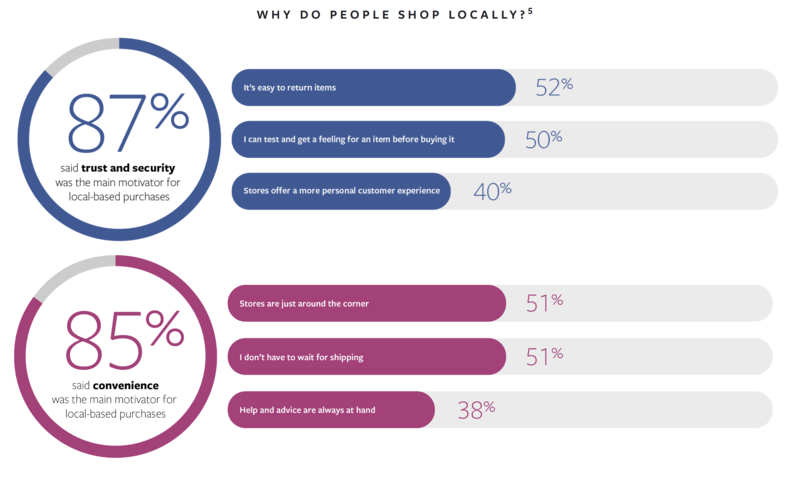 Local Shopping and mobile – Is there a connection? In today’s tech-savvy culture, online shopping has quickly grown to be a dominant force in retail. Yet a recent study by Facebook found that even with online shopping as a ready option, people still love to shop at local stores. Here is why . . .
Facebook has been heavily critisised lately, mostly due to developers ‘ inappropriate use of the vast amount of personal information stored and managed by them. This is a real concern for Facebook users and something that Facebook will need to address in a serious manner in order to regain the trust of their user base. For marketers however, that vast amount of information, across all conceivable demographics, is really attractive and Facebook knows this of course. In fact, Facebook themselves have a research arm that looks into users’ activities and provides insights that help marketers navigate the social media landscape. That research division, called Facebook IQ, has some interesting articles with information, per region, on what their users are discussing online, with advice for running campaigns and influences that drive user behavior. One such article we found interesting is one that looked into how mobile actually helps local businesses. Facebook, of course, is one of the world’s leading mobile app companies, so it is no real surprise that they wanted to look into how their users use the app to interact with other (non-chain) businesses. In fact, they defined a Local Business as one that “isn’t part of a chain, franchise or non-profit and isn’t purely online, but has fewer than five store locations in a single market”. While it is easy to assume the position that “most people shop online these days” the results would indicate otherwise. For example, the study found that, on average, people reported visiting up to seven local businesses a month, and to spending between 40–55% of their total monthly budgets on local products and services! Now remember that this study did not cover shopping at major chains so large grocery stores or big-box retailers are excluded from these numbers. That is quite amazing and says a lot about marketing opportunities for those local “corner stores”. Is the generally accepted point-of-view that small stores are a dying breed, that they cannot compete with the purchasing power and on-line conveniences offered by the large chains. While this may have some merit, it is also true that these large chains make for a very impersonal shopping experience. A more personal customer experience is something that the study identified as being attractive to people when going local and it is a real reason they do so. The study found that mobile users were supporting local business “wherever they are”. Of all people surveyed, 66% used their smartphones to discover small local business and events while in an unfamiliar area. Furthermore, mobile users are more likely to indicate they connect with local businesses across all activities. For example, surveyed mobile-first shoppers were 1.54x more likely to write recommendations and reviews for products and services offered by those local businesses. In other words, mobile devices can actually increase connections between people and local businesses, a very valuable insight and one that small business owners should not ignore. Promote trust in your brand. Facebook’s research shows that trust and security are two of the main reasons people cite for shopping locally, and neighborhood businesses can uphold a brand that is trusted within their community. Optimize your marketing for mobile. When building marketing strategies, make sure people can access your content on any device, from any location. Value mobile-first shoppers. The study shows that mobile-first shoppers are engaged and enjoy writing recommendations and reviews for local businesses. Embrace these “local brand ambassadors” by employing a loyalty reward system and ensuring you continue to engage them in communications. You can read the original Facebook article here. you can improve your mobile marketing strategies?